Dell has announced five new displays at its Innovation event here in Marbella, Spain. The new European range is aimed at a complete cross-section of buyers, from the budget 17-inch SE177FP and 19-inch SE197FP to the high-end 30-inch UltraSharp 3007WFP-HC. The latter £1,159 display boasts a resolution of 2,560 x 1,600 (WQXGA), and features a 92 per cent colour gamut and cold-cathode backlight technology known as W-CCFL (Wide Cold-Cathode Fluorescent Lighting). The unit only has a response time of 8ms, but it's to be expected with this expanse of a display. The model also features DVI-D Dual-Link DVI as seen previously in Apple's 30-inch Cinema Display. It's HDCP-ready, while there's also an integrated card reader and four USB 2.0 ports for connecting extra peripherals. Previously shown by Michael Dell in his keynote at CES, the 27-inch £1,039 UltraSharp 2707WFP is designed for gamers, with a resolution of 1,920 x 1,200 (WUXGA). Response time is 6ms. Again, it's HDCP ready and is styled well, with an aluminum build and beveled glass base. 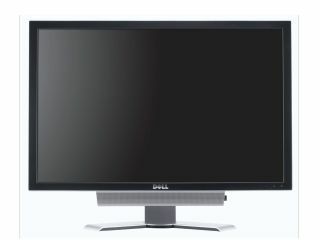 The 22-inch £310 E228WFP has a 5ms response time and 1,680 x 1,050 (WSXGA ) resolution. Like the 2707WFP, it has HDCP ready dual Analog and Digital (DVI-D). The budget models cost £181 for the 19-inch SE197FP and £157 for the 17-inch SE177FP.